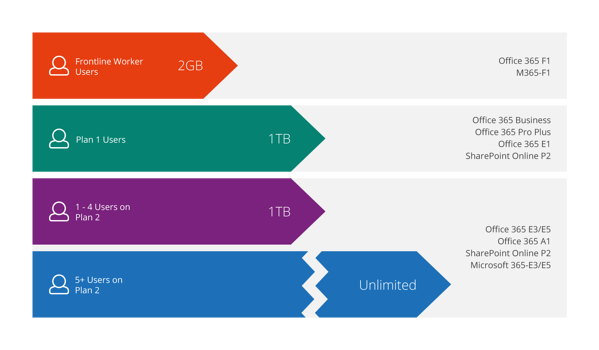 1) How much storage do I get with OneDrive for business? * Note: to get the unlimited storage you need to raise a service ticket. 2) When should I use OneDrive for Business rather than Teams / SharePoint? OneDrive for Business is your starting point for documents that aren't ready to be shared with a wider audience, or for files that only really matter to you. If you've worked on a file which needs to be kept or becomes an asset that a team need to access, you can easily move it to a Team or into SharePoint by clicking on the 3 dots (ellipse) to the left of the filename in the web browser and selecting 'move'. Depending on your organisation’s policies, OneDrive data may not be kept when you leave an organisation, so if the data is important and needs to be preserved, then consider SharePoint or Teams. 4) Can I share internally? Yes, you can. We see that many organisations look to replace the "H:" or Home drive with OneDrive for Business. We recommend as part of user training that users are aware that they can share files and folders with other users, this is unlike a typical Home drive which is normally locked down to only the associated user. 5) Can I share content externally? Yes, you can. That said, some organisations turn off this feature to protect from data leakage or restrict which organisations you can share with. 6) How does OneDrive for Business fit in with My Documents on my desktop? We'd recommend that you stop using My Documents and use OneDrive for Business as it is resilient, and data is accessible from anywhere. An administrator can help you move known folders (My Documents, My Pictures etc) to OneDrive for Business to help this transition. 7) Can I recover a file which I've deleted? OneDrive for Business has a recycle bin which is available from the web portal - login in to Office 365, select OneDrive and the option is on the left-hand side. There is also the ability to restore the whole of your OneDrive for Business back 30 days if you delete significant amounts of content or your files become corrupt. 8) Why do I need the OneDrive client to access SharePoint files offline? The sync client “OneDrive” (onedrive.exe) performs two roles, one to synchronise your OneDrive files and secondly to sync any selected SharePoint document libraries. To sync a SharePoint document library, click “Sync” within the SharePoint page. We really think it should be called the “Office 365 File Sync Tool” – but this may be one for Marketing to work on. 9) Should I sync all my files? The sync client “OneDrive” allows you to select which folders you wish to synchronise, by only sync’ing the files you need to save on local storage space. To select which folders you sync, click on the blue cloud icon, “more…”, “Settings” and “Account”. 10) How can I see which files I have shared? In OneDrive for Business you can easily see which files have been shared with you and which files you have shared under the ‘Shared’ link. This also allows you to take control back of any shared files. If you are an IT Administrator, we recommend you read '10 Popular OneDrive for Business Questions IT Admins Ask Us' next.